The Townhouse Block Party was tonight. 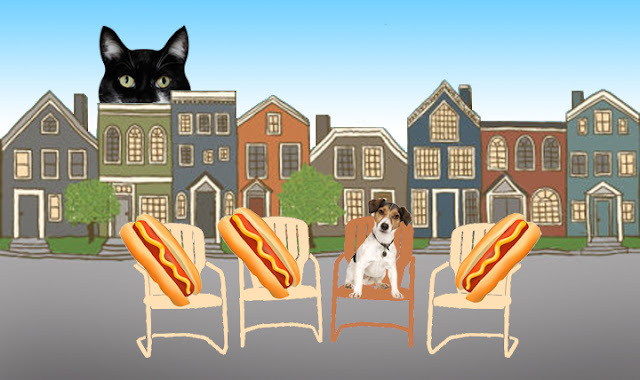 Once a year all of the Townhouse humans (and a few dogs) gather in front of MY driveway in the 90+ degree heat and humidity to eat hot dogs (not the barking kind) and find out what everyone's been up to since last year's Townhouse Block Party. I was not invited. Not even consulted about the use of MY driveway and the adjoining areas. Glogirly and Gloman were instructed to bring a *dish to share. * Make no mistake, I DO NOT share MY dish. I do not share anything ON my dish, anything that's spilled OFF my dish, there's nothing about my dish I share. And if I DID share my dish, I'd NEVER allow a hot DOG to touch my dish. Never. Hmmm, Queen Penelope and I eat out of the same dish! I think I should protest! I completely agree with you. 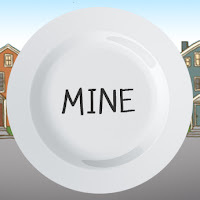 In fact, I am the only one who has their own dish around here. Then I eat from Gemini's and Ichiro's too. My peeps sometimes eat these hot doggy thingies made out of soy... or something like that. I don't know who soy is but they say he's tasty... especially if grilled. I eat from everyone's dish, but NO ONE eats from mine! I feel your pain about the two leggers having gatherings and not inviting you. Mine always use the old "for the safety of the guests" excuse thingy. I don't share my dish either and I think that you should have been invited to the pawty. Thankfully we live in the country. No block pawties fur our 'rents. We barely tolerate the family during the holly-days! 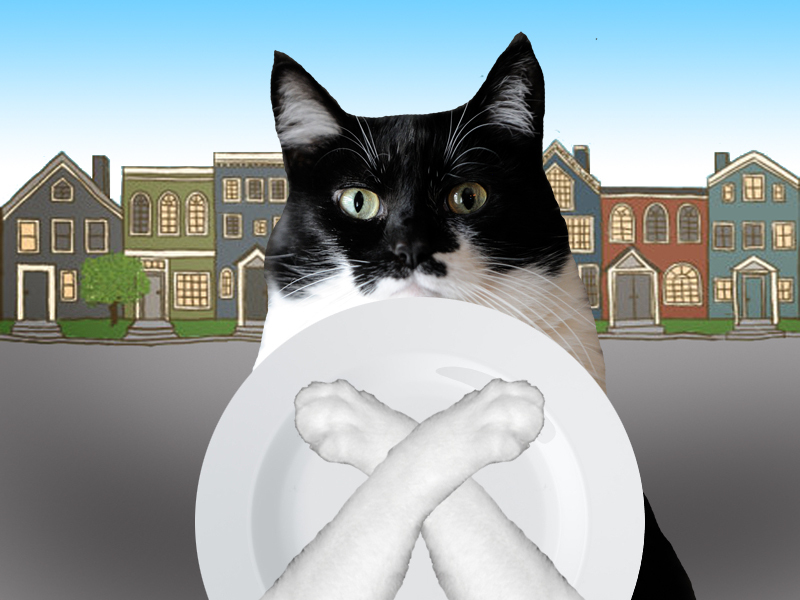 As far as our dishes are concerned - PAWS OFF! 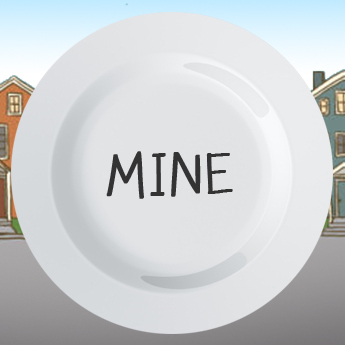 Our dishes are OUR dishes, no sharing especially with a hot dog. I do not share my dish either - Binga and Boodie DO share each other's. I don't quite understand some of these curious human routines. Hammy is allowed to eat my leftovers. He's a lucky boy. Tutu shares ALL our dishes. That's why she's called the dishwasher. MOL. Katie, we're glad to hear you don't share your dish...that's the way it should be. the Daddy eats lots of those hot dog things, and we say, meh, no biggy, it's just dog. Hot Dogs? Is there any other kInd? I have to share with Tigger sometimes. It stinks!!! He stinks! I shall stage a work to rule soon if the staff don't get another dish!! You stick to your guns, Katie!!!! We never eat foods like that, and we often share our dishes! At our house, Sassy and Callie have their own dishes. Sassy does not share her dish with Callie. However, she does expect Callie to share with her! Good thing they didn't try to share your dish--you would have had to have locked them out, much to their embarrassment in front of the rest of the neighborhood, especially since they had the gall to plan the event for your driveway AND invite dogs. OMC! They don't invite you and then they want your dish?!??! I don't think so!! So what DID they bring?? I'm dying to know. I don't like those test tube things that the humans call "hotdogs." Good for you sweetie. I don't let anyone except M or D to touch my dish either. I'll put the bitey on them (with no teeth). i think that is a good dish policy. Oh Katie, sharing is nice. I do not blame you for not sharing your dish -- none of my kitties share theirs either, but they do try to "help" each other finish, MOL.